One of the very first articles I wrote for this blog, back in January 2007, was about the so-called Win-Win Agreement between Columbus City Schools and several of the suburban school districts in Franklin County. Now it appears that the Win-Win Agreement is back in the news again. The Win-Win Agreement came to be in order to settle a dispute that flared up in the late 1970s between Columbus City Schools (CCS) - who wanted the State Board of Education to realign CCS's boundaries with that of the City of Columbus - and the suburban school districts, which at the time were seeing rapidly accelerating growth in new housing developments that were in the suburban school districts, but within the City of Columbus. CCS was becoming concerned about the "white flight" to the suburbs which was occurring in reaction to the Federal Court order to desegregate CCS through the implementation of a busing program. In truth, the dispute was less between the CCS and suburban districts than it was between CCS and real estate developers. The land developers and homebuilders were becoming concerned that if CCS prevailed in their demand to have the CCS district boundaries made coincident with the City of Columbus boundaries, it would stop the "white flight" new home construction bonanza in its tracks. For whatever reason, and through whatever means, developers and homebuilders have always held great political power in central Ohio. So while my neighbors and I in Golfview Woods, one of the disputed developments, freaked out about having our brand new homes we had built in the Hilliard School District sucked into Columbus City Schools, our voices meant pretty much nothing to the politicians. But when the developers and homebuilders got in the game, dealmaking ensued. Nonetheless, it took a little while to sort out, and the parties agreed to at least a couple of one-year moratorium periods while the deal was crafted. The General Assembly eventually got involved, creating laws that not only enabled the Win-Win Agreement, but also encoded some of it into the Ohio Revised Code. While the developers are not named parties to the Win-Win Agreement, they were clearly the winners. 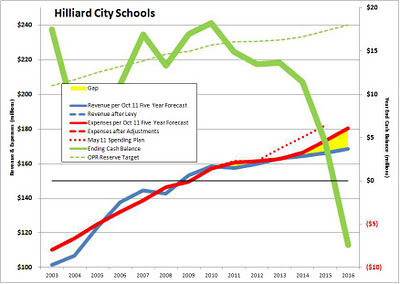 Subsequent to its adoption, the housing boom resumed, and the Hilliard City School district began growing at a rate that led us to build a new school building pretty much every year between 1989 and 2002 (13 buildings in 14 years). We all bear the cost of paying off the bonds issued to finance the construction of all those those buildings, and with every new house built, we subsidized an increasing share of the cost to educate the kids who live there. Key to the settlement of the Win-Win Agreement was a requirement that the suburban school districts make a "revenue sharing" payment each year to CCS. I prefer to call it a ransom payment, and ours has been $1 million per year for a number of years. Some say that this $1 million ransom payment is a good deal for Hilliard Schools, as we collect much more than that in property taxes on the parcels within the area covered by the Agreement. While is true that we collect a substantial amount of tax revenue from the commercial properties within the Agreement area - such as the Columbus part of Mill Run, and the substantial retail corridor on Hilliard-Rome Rd - this analysis is incomplete. To get the full economic picture, you also have to take into account that more than 7,000 of our students - 47% - live within the boundaries of the City of Columbus. That carries a price tag of more than $80 million dollars per year, given our current per student cost of $11,475/yr, half of which is paid with local property taxes. 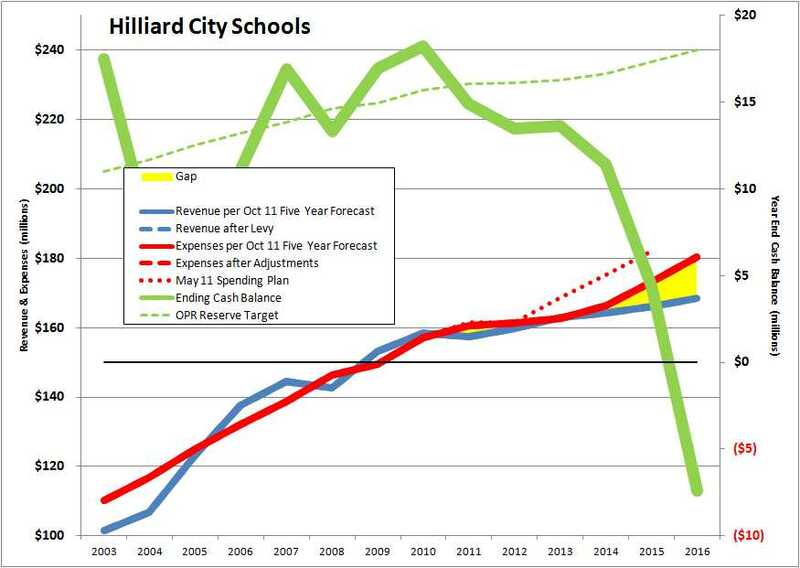 From an purely financial standpoint, there is no question that Hilliard City Schools would be better off letting CCS take all the territory within the City of Columbus, the tax revenue that goes with it, and also all the 7,000 kids we're spending $80 million/year to educate. The state law would require CCS to buy from us a commensurate number of school buildings as part of the process. But we have to take note of a key point: Those houses and apartments now in the City of Columbus were never served by CCS. The land they were built on has always been within the boundaries of the Hilliard City School District, and were in one of several townships until annexed into the City of Columbus, as was required by the City of Columbus in order for the City of Columbus to agree to provide water/sewer services. Elizabeth Warren, the Harvard Law professor, expert on bankruptcy law, and advisor to the Obama Administration, has said - accurately I believe - that one of the reasons for the housing bubble was that families use every dime of money they can scrape up to buy a house in the best school district they can afford. Demand exceeds supply, and prices go up - one of the most basic economic principles. The cost of a house has become the price of admission to a well-respected school district, and a primary factor in the resale value of that house in the future. Those homes within the Win-Win areas were built there because folks wanted to get their kids into Hilliard City Schools, or at least wanted the real estate benefits of owning a home in our school district. I know - as I said we built our first home in Golfview Woods for precisely this reason. To just exit from the Win-Win Agreement would mean telling half the people of our community that we don't want them any more, that we don't care if their kids are booted out of Hilliard Schools, and that we don't care if their property values are further eroded after being absorbed into CCS. I think the more sensible outcome is for the parties to agree that the Win-Win Agreement served its purpose during a unique time in our region's history, but that these ransom payments are no longer appropriate - too much has changed in the ensuing years. In our part of the county, the Big Darby Accord is in the process of becoming established as the policy structure which will dictate future development anyway. April 4, 2012: The Columbus Dispatch ran this story in regard to incorrect billings sent by Columbus City Schools to the suburban districts who participate in the Win-Win Agreement. Hilliard Schools will need to pay the full $1 million 'ransom payment' plus $96,000 in accumulated errors in billings over several past years. I've written a great deal about the 90% of our spending which has to with compensation and benefits. This article is going to be about something in the other 10% - our cost for natural gas. Natural gas is one of those commodities for which "futures contracts" can be written to lock in prices for points in time out in the future. Commodities futures trading and its first cousin, options trading, are a favorite investment vehicle for speculators, and are often viewed negatively because of it, but they have legitimate purposes beyond speculation. For example, farmers like to know, before they plant in the Spring, what they'll be able to sell their crop for in the Fall. They can do that by signing a contract to sell a certain amount of corn, for example, at some point in the future for a certain price. This week, the price of corn to be delivered in December 2012 is about $550 for 5,000 bushels. A farmer who signs such a contract would be obligated to deliver 5,000 bushels of corn this December, and accept $550 in payment. So what's the harm in that? What if a big October windstorm flattens his corn before he gets it harvested? The contract still obligates him to deliver 5,000 bushels of corn in December, and be paid $550 for it. In order to fulfill his contract obligations, he'll have to buy 5,000 bushels of corn from someone else. Remember that this $550 price was set in March. Now it's December and a lot of things might have changed. It could be that a lot of the corn crop nationwide was lost, and the price of corn has therefore skyrocketed due to the reduced supply. Maybe he'll have to pay $800 for 5,000 bushels of corn, just so he can turn around and sell it for $550. And he's already out all the money he had invested in the crop that was wiped out by the storm. A farmer can further "hedge his bet" by buying futures options, but that's another topic for another time. By the way, anyone who uses the phrase "dumb farmer" has no grasp of the complexity of the fiscal decisions these folks have to make in order to have any hope of surviving over the long haul. They have to be prepared to make a nice profit when the opportunity presents itself, and to survive times when it seems like Mother Nature and the commodities market are conspiring to put them out of business. Both situations require knowing when to buy supplies and heavy equipment and how to use the futures market and crop insurance to mitigate risk. They don't just throw seeds in the ground in the Spring and rake in the money in the Fall. Our school district is a commodities player as well. We have to buy significant quantities of electricity, natural gas, and diesel fuel to operate our buildings and buses. As every American is painfully aware, the prices for these commodities have never been more volatile. So it is reasonable for the school district to make purchases of these commodities via futures contracts that give us some predictability as to our future costs. There is risk if we do, and there is is risk if we don't. If we don't buy futures contracts, the prices could shoot up rapidly, creating havoc in our budget. This was the concern back in early 2008, when natural gas prices were going through the roof. In the first six months of 2008, natural gas prices increased from around $8 per MMBtu* at the beginning of the year to over $13 by early summer. That's over 60% in just six months. At that rate it could be $20 by the end of the year. Our school district is a member of a buying consortium called the Metropolitan Education Council (MEC), through which nearly 200 Ohio school districts have joined to buy everything from school buses to IT services. When this run up of natural gas prices was happening, the MEC joined a larger buying group to purchase millions of dollars of natural gas futures. While I was not part of that decision process, I imagine that the intention was to create some predictability for our budget, and also to lock in the current price should the price continue to go up at that astronomical rate. This consortium started buying futures contracts in June of 2008. They were at a price of $11.45, with monthly delivery dates stretching through May 2014. In July, they bought a bunch more at a price of $10.19. Those had to look like pretty smart decisions after seeing the price hit $13 in early July. If prices had indeed doubled by the end of 2008, as it looked like they might, we would have saved a ton of money. As you can see, by year end the prices settled back to about where they had been at the beginning of the year. Now we're holding contracts to buy natural gas for 50% over the market price. So what did they do? In September 2012, after the prices had dropped back to the pre-spike levels, they bought another batch of natural gas futures for around $9. By the way, you can identify pricing spikes only in retrospect. While the prices are rapidly increasing, it's impossible to tell whether it is a spike, or a permanent lift in prices. In 2008, the folks making this natural gas decision thought it was the latter. A decision to buy more contracts at $9 is reasonable if you're relatively sure the prices are still generally headed up. But they weren't. This is the pricing chart for 2012. Instead of going up, natural gas prices have continued to plummet. Right now, the price for natural gas to be delivered in December 2012 is lower than for gas to be delivered this month. Now it doesn't look so smart to be paying $9-11 for natural gas when we could just buy it from anyone today for a third the price. So we want to get out of our old deal. What does that entail? Well, we need to get someone to buy all these high-priced contracts. But frankly, there's no reason for anyone to pay any money at all for a contract set to a price that is higher than the market price. It would be like me standing next to a pump at a gas station, trying to sell a can full of gas for $10/gal when the price on the pump is $4.00. If I really want to get rid of that can of gas, I'll have to give to you the gas AND $6.00/gal to make up the difference in price. That's what your School Board voted to do at the March 12, 2012, when we passed item F1 on the agenda. This authorizes the Administration to pay the cash necessary to get us out of the old contracts. Given current futures prices, this is estimated to be about $300,000. In other words, since 2008, we have been paying a substantial premium over market prices for natural gas, and are now having to pay another $300,000 to get out of that deal. So were the Administrators who recommended this deal, and the School Board members who approved this in 2008 all bozos? It's easy to make that assessment with 20/20 hindsight isn't it? But what did the situation feel like then? I can tell you - it looked pretty scary on all economic fronts. I was so scared about the state of our financial system that I pulled all of my retirement savings that I had in money market accounts - instruments that had always been considered extremely safe ways to hold short-term cash - and shifted them to FDIC-protected Certificates-of-Deposit at commercial banks. It was a reasonable bet, and I think that - had I been sitting on the School Board then - I might well have voted in favor of that resolution as well. Decisions can't be remade in the past. All we can do is make decisions for the future. That's what this resolution at the last meeting was all about - to get out of what has become a bad deal, and make the best decision we can for the future. By being able to return our natural gas prices to current market levels, the payback on this buyout cost will be less than two years, and I think that's reasonable. Should the decision have been made sooner? Probably, but that's hindsight too. Our natural gas costs have apparently been way above market for at least three years. But remember, that as soon as the spot prices dropped, the cost to get out of the futures contracts we already owned went up simultaneously. Wouldn't it have been stupid to buy out of these contracts in 2009, then have prices go back up in 2010? Like I said, there's a risk associated with such decisions. There's also a consequence to not making decisions. It could have gone either way. This new resolution authorizes the Administration to enter into a new buying agreement via the MEC, through which a new set of natural gas futures contracts will be purchased. It seems like a good move to buy futures when prices seem pretty low. But who knows what the opening of the vast gas fields in eastern Ohio will mean to us. Can/will natural gas prices go any lower? When these futures will be purchased, for what delivery dates, and at what prices will be determined by a "Hedging Committee" appointed by the members of the consortium. I hope our own Treasurer Brian Wilson gets to sit on this committee, but if not him, then our Operations Team is gunning to have Jeff McCuen, the Treasurer of Worthington City Schools be our voice. * Natural gas is sold in a unit of measure called the "MMBtu," or millions of British Thermal Units, which is a unit of energy, not volume. This is because natural gas can be transported and consumed at various pressures, allowing it to be in the form anything from a dense frozen liquid (very high BTUs/gal) to the gas that comes out of your kitchen stove. By pricing the commodity in units of energy, it doesn't matter what physical form it is in when the transaction takes place. This is the fourth article* I've written about the precarious condition of the State Teacher's Retirement System (STRS). It is prompted by a recent article by Kathie Bracy, an activist for the concerns of retired Ohio public school teachers (Ms. Bracy is a retired 30-year veteran of Columbus City Schools). She writes about a recent special meeting of the STRS Retirement Board, during which they received a report from their actuarial consultant, Price Waterhouse Coopers. It wasn't good news. Actuaries are highly specialized financial professionals who use a mixture of finance, accounting, statistics and risk analysis to determine if organizations can honor their future financial obligations. Their work is especially associated with insurance, where one must figure out if the money taken in over time (premiums), plus investment returns on the collected funds, will generate enough cash to pay future claims. One could think of a pension system as being just another kind of insurance. But no one knows exactly what the future will bring, so actuaries have to make guesses - well reasoned as they may be, but guesses nonetheless - on pretty much all of these variables. So what did PWC have to say to the STRS Board? Inflation: They said that they believe current and future inflation rates will be less than previously assumed. This is mixed news. The good side is that the lower the actual inflation rate, the less the investment rate of return will need to be. But low inflation also means that interest rates on current investments will be lower. Today is kind of an insane time, when the 'safe' sovereign debt instruments like short term US Treasury Bills and German government bonds have near zero - and in some case negative - rates of return. Mortality: People are just living longer. I've heard it said that Social Security was designed around the assumption that people would retire at 62 and die before they reached 70, which may well have been the average life expectancy 80 years ago. Today, most of us expect to live well into our 80s. In the case of teachers, who can potentially retire in their late 50s with 30 years of service, the time span of retirement can equal the length of their working career. This may be good news is most contexts, but in the case of a retirement system - it's a big problem. Investment Returns: STRS has been assuming that it could make 8% return on its investments. One of the core tenants of investing is that Risk and Return are inversely related. Students of finance have long been taught that the "riskless" return rate in our country should be the rate one can receive investing in US Treasury Bills, with the assumption that the US government would never default on its debt. That's the reason it was such a big deal when Standard & Poors, one of the world's most influential debt rating agencies, downgraded its rating of US Treasury debt a few months ago. They were in essence saying that there is some risk of default by the US government. Fortunately, most investors have ignored that, and are continuing to buy record quantities of US Treasury Bills. STRS has been assuming for a long time that it could earn 8% on its investments. That's perhaps no big deal when US Treasury bills are paying 5% interest, as they we so many years ago. One doesn't have to take a lot of risk to earn 3% more than that. But with 'riskless' interest rates near zero, an 8% annual return requires finding investments that pay 8% more - a relatively large 'spread.' It's like saying you can make 13% every year when Treasury rates are 5%. Not easy, and not without risk. (Here's what the New York Times wrote about this). STRS was reminded of that recently, when its portfolio heavy in stocks and real estate lost nearly half its value - from $80 billion in 2007, to $47 billion in 2009. They're lucky the stock market has recovered a lot of what they lost, and the portfolio value now sits at $63 billion. But they're still down nearly $20 billion from their peak portfolio value. Not only that, but since their assumption was that they would make 8% on their portfolio, they're down $45 billion from the $109 billion the portfolio should be worth had they made 8% every year since 2007 when the portfolio was worth $80 billion. That's $45 billion they should have had to pay for future benefits, but now don't. PWC has advised STRS to lower its expectations of investment earning from 8% to 7.75%. That may not sound like much, but one would have to deposit 9% more today to generate the same dollar amount 35 years from now, assuming just 0.25% less in annual return. Think about raising the contribution rate from the current 24% of salary (10% by the teacher and 14% by the taxpayers) to 33% 26%. We're talking millions of dollars more per year. Salary Growth Assumptions: The teachers retiring now were paid peanuts 30 years ago when they started their careers. But most are now being paid in the neighborhood of $90,000/year in their final years. Their annual pension is determined by their final pay, not their lifetime earnings, and for a teacher retiring right now under current STRS rules, with 35 years of service, the annual pension will be about $80,000/yr - for life - plus annual cost of living increases. What about a teacher being hired right now? Under the current collective bargaining agreement with the teachers' union, the starting salary for teacher with no experience and only a Bachelor's degree is $38,362. If we assume the salary grid structure stays as is for 35 years (ie 4.15% steps and 6% raises for additional education), base pay increases are 1% every year (they were 3% or more from 2004-2010), and the teacher reaches the Masters+ level by the 10th year, then the final pay of such a teacher at 35 years of service would be about $136,000, and the pension would be about $103,000 per year. We don't know what's going to happen to compensation outside the realm of public education. Maybe private sector salaries will increase at an even greater pace than this. Maybe it will be less. Over a period of three decades, we're apt to have both boom and bust times. We don't know. But for the purpose of analyzing the state of STRS right now, the actuaries have said salaries have increased in recent times faster than they assumed they would, which means more benefits will have to be paid out than had been planned for. That's not good. 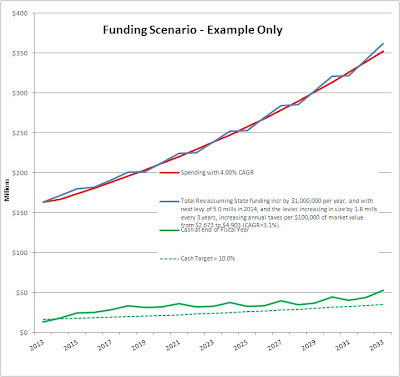 The sum of all this is expressed in a single statistic STRS calls the "funding period." It is the amount of benefits that will be paid out in the future (I think they mean the 'present value' of the future benefit costs) divided by the current annual contribution rate (ie what working teachers and the school boards are paying into the retirement system each year - currently a total of 24% of salary). By law, this is required to be 30 years or less. Think of it as being a calculation of how long it would take to pay off your credit card balance given monthly payments of $X, understanding that each month the credit card company will charge to the account another 18% or so of the unpaid balance for interest. We all know that if you make only the minimum required payment on your credit card balance, it will never be paid off. This is the case with STRS right now as well. The "funding period" is infinity - there simply isn't enough money being taken in to pay what will be owed to current and future retirees, even with an aggressive assumption of investment earnings rates. As stated at the beginning of this article, the main variables relative to a pension plan is the amount of money being contributed, the size of the current fund, the earnings rate on investments, and the amount being withdrawn to pay benefits. For a pension fund to pay out all the benefits promised, those factors have to be in balance. Right now they are not. Not even close. Too much has been paid out and the investments haven't generated as much earnings as expected. In fact, they have lost tens of billions of dollars in recent years. Changes have to be made - soon - or the fund with go bust, leaving both retired teachers and teachers yet to retire with no benefits. Make the currently employed teachers pay more: They already pay 10% of their salary into the retirement system. Reduce the benefits to retired teachers: Take back some of the benefits the teachers already retired now receive. That might not seem fair, but one could argue that teachers now retired are receiving far more than the system was designed to pay them, largely because of the rapid ramp-up of teacher salaries in the past decade or so. Remember that pension benefits aren't determined by lifetime earnings - only what the teacher was paid in the last 3 years of service. Reduce benefits to future retirees: Reduce the payout percentage, or calculate the final pay by averaging more years. An increase from 3 years to 5 years is already being considered. Require teachers to work more years before being eligible for retirement. Make investments that might generate higher return, but carry more risk: At what point does investing become speculating, or just plain gambling with the teachers' pension money? I think that chasing even 7.75% returns means taking an unacceptable amount of risk. Make the taxpayers pay more: As taxpayers, you and I already pay 14% of all the teachers' salaries into the retirement system. Note that this means that the dollar amount we contribute each year goes up with the all the increases the teachers receive: base pay, steps and degrees. The taxpayer share could be made to increase via several ways. The General Assembly could simply mandate that the school district pay a higher percentage of salary. That will eat up budget dollars, and contribute to larger and more frequent levies, or cuts in programming and services. Or the General Assembly could divert some of the state budget to augmenting the contribution stream. But if they do this for STRS, they'll have to do it for OPERS (Ohio Public Employees Retirement System), SERS (State Employees Retirement System), and the Police and Fire Retirement Fund. That will require an increase in our state taxes, or further cuts in state services and funding to local goverments (like school districts, which would in turn cause us to cut services and programming or raise local taxes). What do you think needs to happen? What combination of the above do you think is fair? In the last two articles, the sources of school funding were reviewed, as well as how all that money gets spent. In this article, we'll put those two pieces together, and explain what that might mean for our future. You've heard me say before that I believe that one of the most important documents published by our School District is the Five Year Forecast. And once again I'll say that I believe this not because money is the center of everything, but rather because money is the fuel with which we run our school district, and we need to manage it attentively. More than one auto racing team leading a big race has lost because they misjudged their fuel consumption, and ran out of gas on the final laps. We can't let that happen to us. A lot of time, effort, and money has been invested to get our school district to the position it is in, but it can be erased in the blink of an eye if good and timely decisions aren't made - soon. Like a racing team, it's important to know when we can step on the gas - accelerating our rate of advancement, but burning gas at a higher rate - and when we have to let up a bit and conserve fuel. Racing teams prepare a strategy for fuel management before the race starts, and adapt as conditions change. The Five Year Forecast is our fuel management strategy, and is an important component of the overall strategy of the District, as documented in the 2020 Initiative. The School Board has committed that - unless the State of Ohio materially whacks our funding even more - another levy request will not be made before 2014. 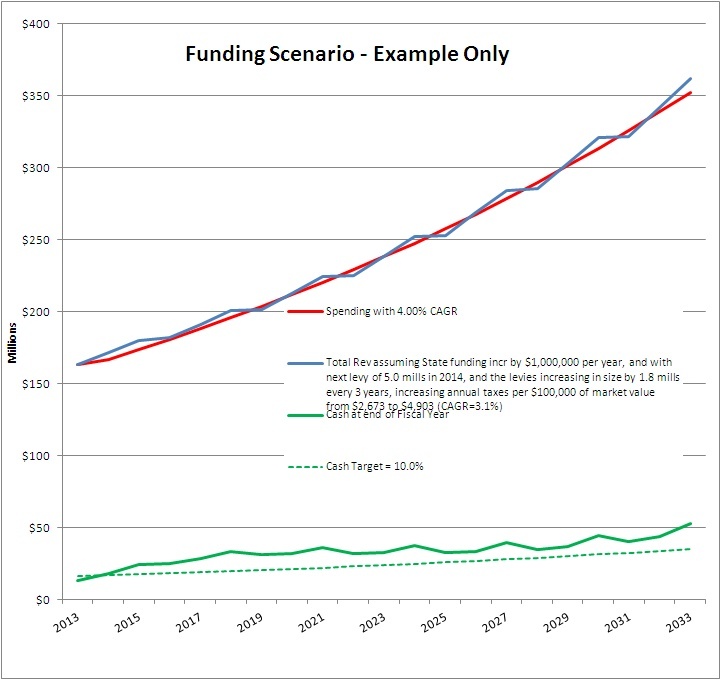 Given the spending budget built into the Five Year Forecast, there is little question that a levy will be proposed in 2014. If you examine the red line in the chart above - Projected Expenses - you'll note that in the period from 2003 to 2010, expenses grew at a rate of about $7 million per year. 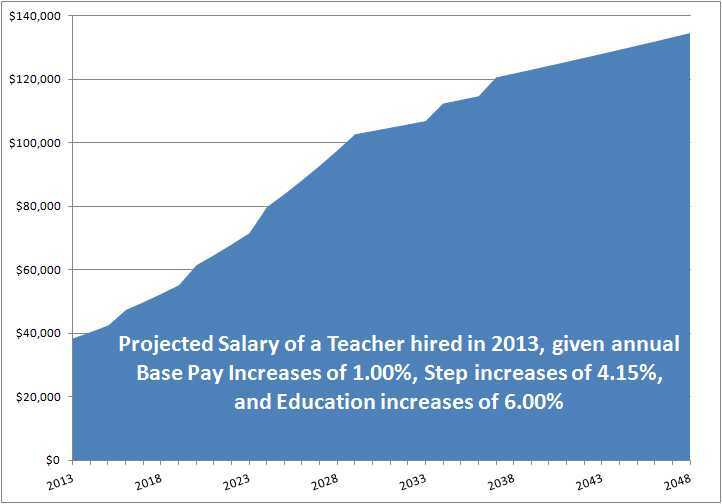 This is a time when the contract with the teachers' union included base pay increases of 3% and more per year, in addition to step increases (see Teacher Salary History to learn more). Then the spending growth is shown to nearly flatten out through 2013. This is for two reasons: 1) the teachers' union agreed to freeze base pay at 2010 levels through 2013, to delay some step increases, and eliminate one altogether; and, b) the projected effect of an early retirement incentive program, which has been accepted by about half the teachers eligible. But by 2015, the spending growth is projected to resume at an annual rate of about 4%, or about $7 million per year. Why? Compensation and Benefits - the same reason as always. The Five Year Forecast assumes that the current step schedule is resumed in 2014, along with annual base pay increases of 1%. What that means is that about half of our teachers would be getting 5% annual increases, while those on the higher end of the pay scale (at an annual salary of $79,000 or more) would receive 1% pay increases. This represents about $4 million per year in spending growth on compensation, or 3.8%. Benefits are projected to increase at an even higher rate - 6.3% per year, driven mostly by health insurance costs, in spite of the increase of the employee share of the cost from 10% to 15% in FY2012. This is another $2.6 million/year of the spending growth. The remainder of the annual growth - about $350,000/yr - is all the other things the districts spends money on, such as utilities, diesel fuel, and consumable supplies. You'll note that the Revenue line (blue) closely follows the Spending line (red), which is desirable as it means the amount of cash reserve (green) stays fairly constant. But since the Spending is growing at a constant percentage (4%), the year to year growth in dollars increases, and that means that each successive levy needs to get larger. For this scenario, I made the 2014 levy be 5 mills, then increased the millage rate by 1.8 mills with each successive levy. That would mean that by the time we get to 2032, the levy on the ballot that year would need to be nearly 16 mills. Fat chance of that passing. Well, it would be nice if the State of Ohio returned more of our tax dollars back to us. According to CUPP Report produced by the Ohio Department of Education, we get back only 41% of what we pay annually in income taxes. To be sure, we have a responsibility to fund our share of other State programs like Medicaid and the corrections system, but are we funding more than our share of the cost of other school districts? There are some folks, such as the Ohio Association for Equity and Adequacy of School Funding who argue that the poorer districts in this state still aren't getting enough. I think my assumption that our State funding will grow by $1 million/year is realistic - maybe even a little optimistic. It would be even better if the municipalities which overlap our school districts, especially Hilliard, Dublin and Columbus, would bring in lots of new commercial development, generating an growing revenue stream for the schools (and the cities) without adding to the student population. But for now, the cities seem intent to encourage the construction of family-friendly apartment complexes, which add to the student population but generate much less school tax revenue than single family homes. Granting TIFs to apartment developers, as was the case with the Schottenstein apartments at Roberts and Alton-Darby Rds, just makes matters worse. As I've said many times, our costs are driven primarily by how many people we employ, and how much we pay them. Our economic solution has include making strategic changes in these elements. Asking our teachers, staff and administrators to forego pay increases for another 20 years is mathematical solution to the situation, but it's not reasonable. We certainly need to work with the unions to seek a more sustainable compensation model. I think that could mean introducing mechanisms that cause total personnel costs to better track the general economic conditions of the community. By that I mean that when times are good, the team should enjoy that along with the rest of us, and when times are tough - like now - they should take the hit along with the rest of us then as well. On that point, one could debate the role the Senate Bill 5 situation had in causing the 2011-2013 union contracts to have base pay freezes, step delays and higher health insurance contributions, but the fact of the matter is that the teachers, staff and administrators have at least temporarily slowed the growth in personnel costs, and I for one appreciate that. We also need to think about the breadth and depth of our programming and services. One of the first steps might be to carve off extracurricular programming, and make them full pay-to-participate activities. This would be a step fraught with emotion - especially for the parents of teenagers, the primary consumers of these programs. But there is a growing fraction of the voters who are saying that they're tired of their property taxes going up every 3 years, and they want to see this kind of stuff cut before they'll vote on any more levies. Maybe it's time to think about adding an income tax component to our funding structure. Ohio law allows school districts to use two forms of income tax. The first kind is on all income, and is paid by everyone who lives in the school district. It is not imposed on businesses however, so the funding burden is more concentrated versus property taxes. The cities could bring in lots of new commercial activity, and it would cause no revenue lift to the schools. The second form of income tax permitted is called an 'earned income tax,' and that essentially means that only income from W-2s is taxed. This form of income tax was supposedly created to ease the burden on retired folks (like me! ), but it also has a political angle: retired folks typically represent a large voting bloc in a community, and while they are less likely to favor increases in property taxes, they are very easy to sell on the idea of a tax they won't have to pay. Income taxes have a dark side: while revenues tend to grow while the economy is healthy, there can be a rather sudden decline in revenue when things go sour, as has been the case for the past 5 years. This is the reason that the Federal, State and municipal budgets are in such disarray - not so much an increase in spending as a sudden loss of revenue. Property taxes are a very stable source of funding for schools, but that can draw us into complacency. The only thing that is clear is that we've reached an inflection point in the economic health of our school district. We can't do things for the next 20 years in the same way as they have been for the past 20. The sooner we face up to that, and start building a new model, the less painful the transition will be. There's a saying that goes "A good decision made late is the same thing as a bad decision." I think that's very applicable right now.